Membership is recorded by inviting people to enter their name, address, email address and telephone number in a register. Details are entered in respect of each calendar year and the current annual subscription is £nil. The register is normally available at the Annual General Meeting and at the Yorkshire Garden Railway Show. Dixon Green is attending the Trains event at Armley Mills on Saturday 4 May. Contact Phil Thompson if you wish to run. Museum. Explore the secrets of our fascinating locomotive shed with free guided tours and find out about our work researching our historic collection of railway wagons. Enjoy delicious African food throughout the day.. Normal museum admission charges apply. 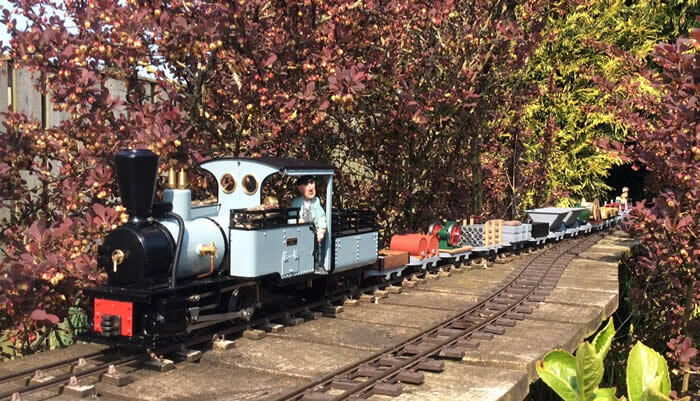 The Yorkshire Garden Railway Show will be back at the Elsecar Heritage Centre in 2019. It will be a one day show on Saturday 28th September. "Yorkshire 16mm Steam" to watch Yorkshire Group Open Days and other narrow gauge events. Members of the company receive a copy of the Report of the Directors and annual Financial Statements, together with the Annual Open Day and Regular Running programme, and are entitled to vote at the Annual General Meeting. Butane Gas is also available to members at cost price: contact Andy Cooper for details. The main purpose of the Company is to organise Events and Open Days in Yorkshire and to oversee the running of the Yorkshire Garden Railway Show. These events included a number of shows and full-day garden railway meetings. In addition, members in Huddersfield, South Yorkshire and the Leeds area get together regularly on summer evenings – the "Huddersfield and District Shed," "Sheffield Shed” and “Leeds and Bradford Shed” are a popular informal way to enjoy playing with steam (and battery) trains in the garden. Our open days are very sociable affairs. The Yorkshire Garden Railway Show takes place over one day, usually in the last weekend in September. One of the larger shows in the garden railway show calendar, visitors can expect to see at least four large layouts and more than thirty suppliers of garden railway equipment. The company owns three portable layouts constructed to 16mm scale, together with trailers used to store and transport the layouts. Mount Dowd is a large layout that is ideal for operating a number of trains at once; Dixon Green is a large scenic layout more suitable for smaller and geared locos, and Saed-y-Parc is a end to end dumb-bell with sidings and scenic interest. Dixon Green and Saed-y-Parc can be joined together to form one very large layout. We are all involved in 16mm Narrow Gauge Modelling in or around Yorkshire. We also have friendships and activities that cross the boundaries of Yorkshire to adjacent counties. Many members have their own garden railway. This is not a necessity, however, since there is plenty of opportunity to run trains on other members’ railways. Indeed, a good introduction to the hobby is to try and work your way around all the open days and other activities – you will probably need around two years to fit them all in! Disclaimer The opinions on these web pages are not necessarily those of the Board of Directors nor Company and should not be taken as Company policy. Further we have no connection with any firm mentioned herein. The Yorkshire Group of 16mm Narrow Gauge Modellers Ltd as publisher and the Web Site Manager cannot be held responsible for any error that may occur in the text. Reliance placed upon the contents of these web pages is at the readers' own risk.